Epson Launches First Inkjet Printer in UAE | TonerGreen - Eco-Friendly Toners from the U.S.
Epson L550 | Photo courtesy by Google Images. Epson, a Japanese multinational company that manufactures electronic products and is known as one of the world's manufacturers of computer printers and imaging related equipment, had released its first range of inkjet printers in UAE--the Epson Workforce M200, M105 and M100 ink monochrome ink tank system printers which are first in the market, and the L550, L355 and L300 colour printers for home users or small-office use. "Middle East business resource website AMEinfo.com reports that Epson has released its first range of inkjet printers in the region, designed to provide “continuous reliable printing” and enable users to refill ink easily." "Launched at the Media Roatana Hotel, Dubai, the Epson Workforce M200, M105 and M100 are the first monochrome ink tank system printers in the market and are designed for small office and home users, with L550, L355 and L300 colour printers also included in the launch." The Epson Workforce M200, M105 and M100 as stated earlier are the first monochrome ink tank system printers in the market. The Epson M200 features an Ethernet connectivity and ADF (Automatic Deocument Feeder). The Epson Workforce M200 is a multifunction printer while the two other printers, the M105 and M100 are single-functions printers capable of wireless connectivity. The Epson Workforce M200, M105 and M100 offers a fast printing speed of up to 15 pages per minute--all our monochromatic printers. The Epson L550, L355 and L300, on the other hand, are all color laser printers. The L550 is a multifucntion color printer capable of printing, copying, faxing and scanning. While the Epson L355 is an all-in-one printer which can scan, print and copy, while the last one, the L300 is a single-function printer. Do you need Epson printer supplies? 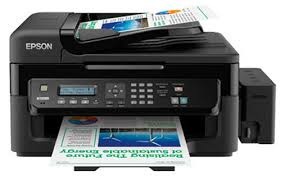 TonerGreen offers a wide supplies of Epson ink and toner cartridges.